This is not going to be a kit. However, Thomas Sasser has been given permission to kit the Copernicus by James Cawley from Star Trek: Phase II. He will be do his kit via PNT Models through Federation Models in 1/1000 scale. As I said earlier in the thread, this 1/650 build is just a practice run to learn my way around the ship. I plan to build another one in 1/350 and completley light it. Last edited by Tracy Mann; 11-02-2009 at 09:31 AM. This is beautiful Tracy! Nicely done sir! Sorry folks, no new pix. I'll be away from my hobbyroom, so this project will be on hold for a while. I've been called back to work by American Airlines and will be in refresher flight training for the better part of the next two months. I'll try to get some head-way on the project whenever I can jump on a jet and head home for a weekend to spend some time with the family. I'll try to post new pix whenever I've made some progress. JT Graphics is putting the finishing touches on the decal graphics, and Absolute Models is rendering the base design for the display stand the model will be mounted on. Thanks for tunning into this thread and all the kind remarks on this very fun project. Last edited by Tracy Mann; 11-09-2009 at 09:13 PM. Well, I'm back on these forums after 3 years and I'm glad to be back on. This project has been done since early 2010. It was the study build for a 1/350 scale version. I have the extra 1/350 kit, the extra lighting kit and the additional tools to pull it off - the biggest being a vacu-form table to make the secondary hull hollow and lightable. Using a circular stitching screen to make a paneling template. primary hull, reducing the rust ring effect. JT Graphics Bussard vains painted. I have everything I need to start the 1/350 version, but right know my heart is into the large Lunar Models kit. I'm not just building it... I am correcting everything wrong with it. Looking forward to sharing what I have so far. Look for the thread soon. Damned beautiful and a lot of fun to do by the looks of it. Looking forward to that Excelsior too. She's beautiful, Tracy. And, like Neb said, welcome back. We kept the lights on for ya! BTW, you don't need to post links here. Inline pictures are more than welcome. (Except instead of that first (, it'll have a [. Incidentally, I LOVE that base!!!!!!!!!!!!!!!! Dave Tomita of Absolute Models rendered the bases graphics for me after I gave him images of the Copernicus' command logo. The "stop light" logo was designed by Star Trek: New Voyages executive producer James Cawley. Dave use to sell acrylic and wood display bases for sci-fi vessel subjects. Being a good friend of mine, he hooked me up with the last of his stock. Bought a couple sets of his decals for the 1/1000 TOS kit----great stuff and fun to use. Looks like I'm gonna start ramping up work on the 1/350 Copernicus. I now have a vacuum form table capable of making pulls for anything regarding this project. I'll start a fresh thread for the larger project. Last edited by Vidar710; 04-26-2017 at 07:37 PM. 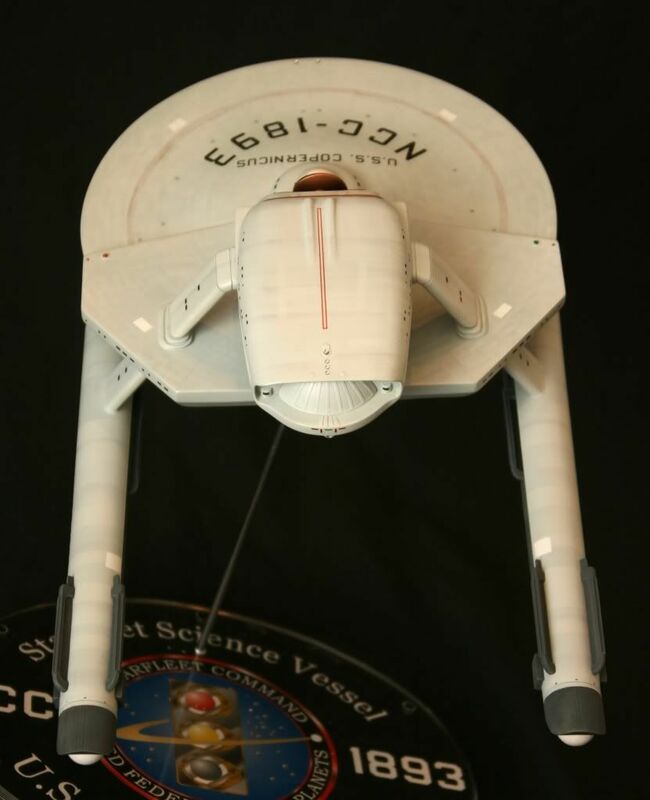 If you ever go to the original set tours formerly use by Star Trek New Voyages in Ticonderoga, N.Y., you’ll see this model on display there. Glad to see it have a worthy home where it can be appreciated, because it just attracts dust in my hobby room. Cool! Visiting those sets is definitely on my to-do list!